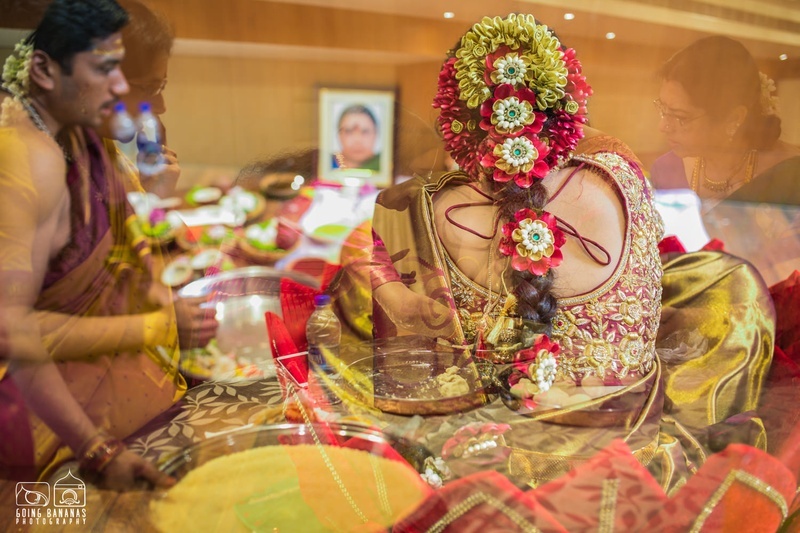 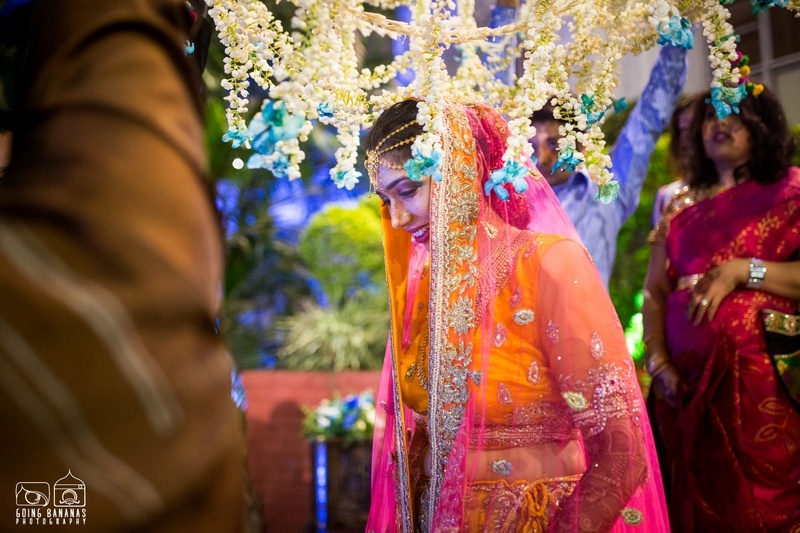 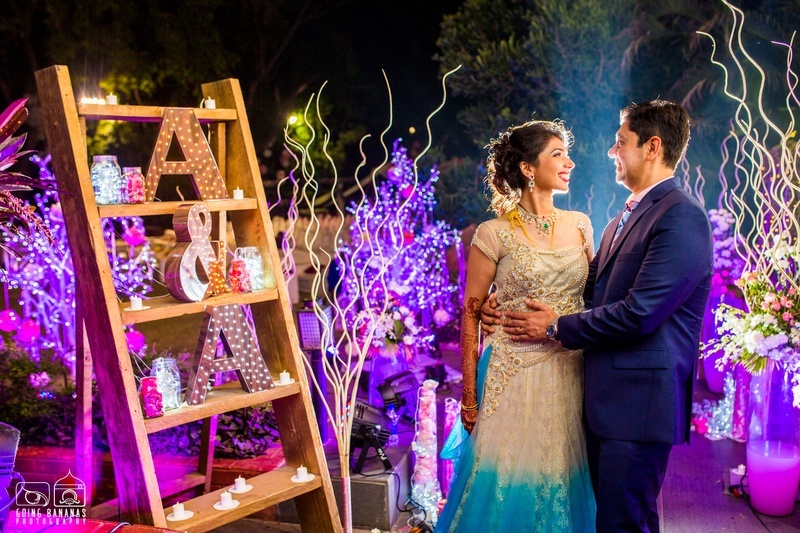 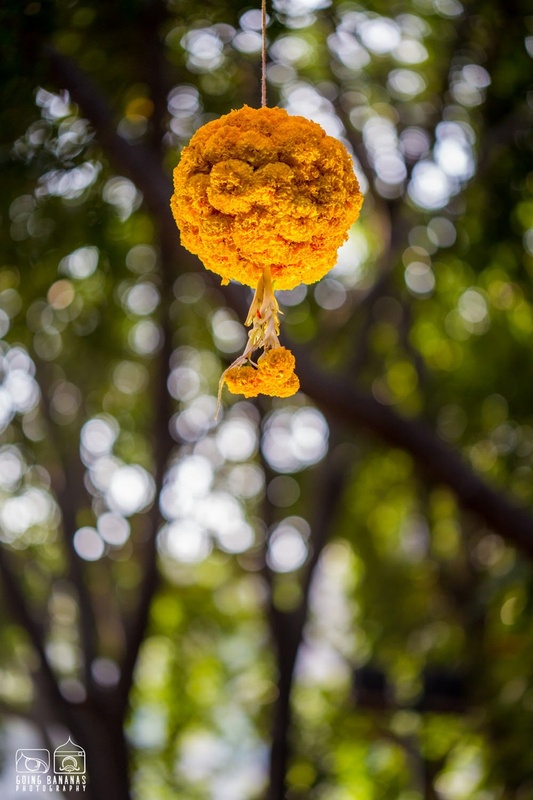 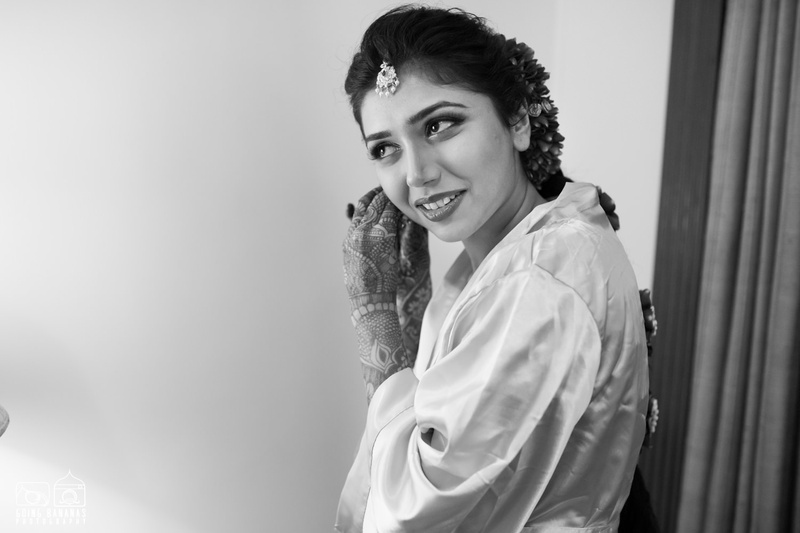 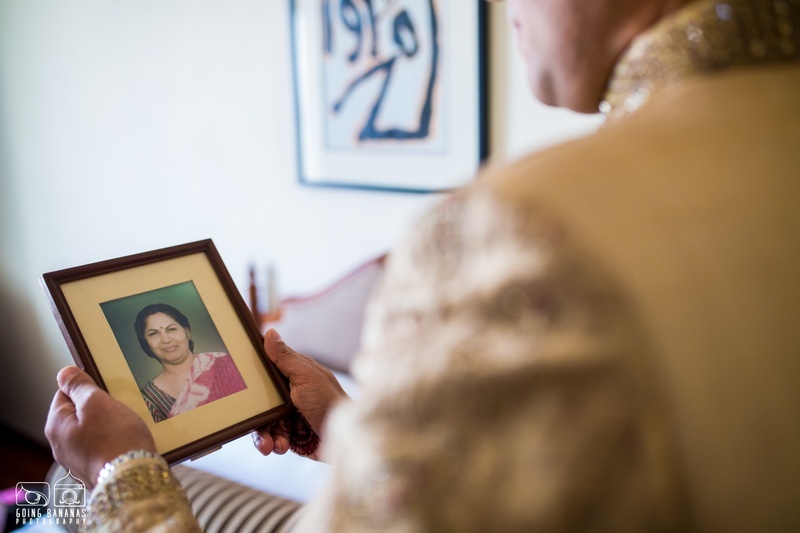 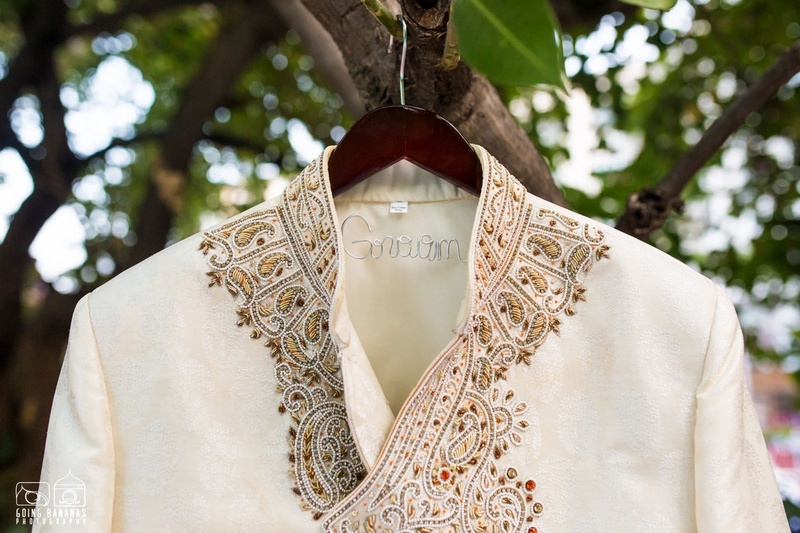 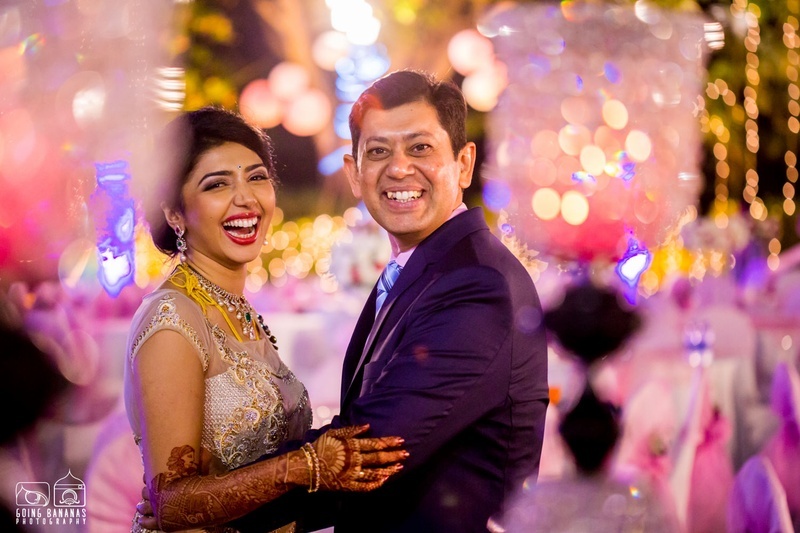 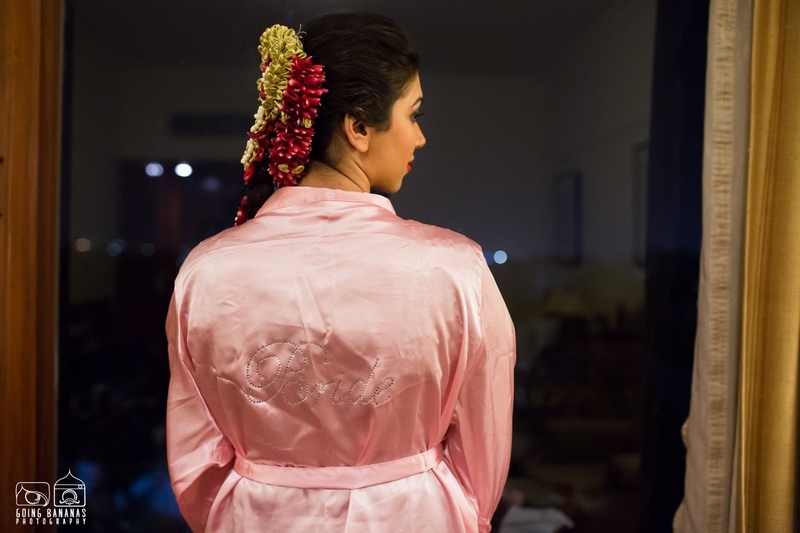 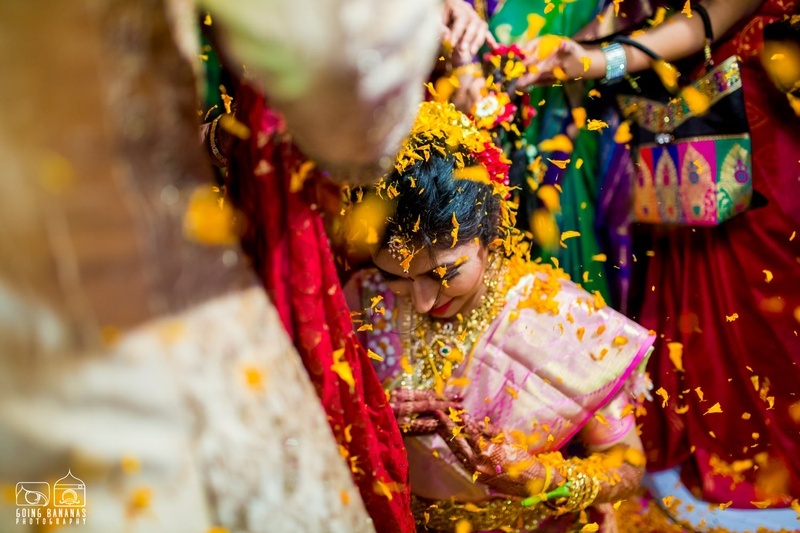 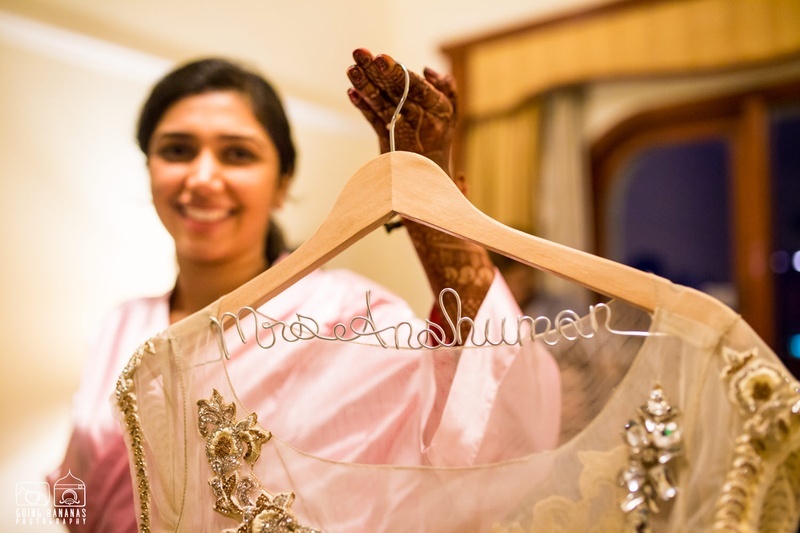 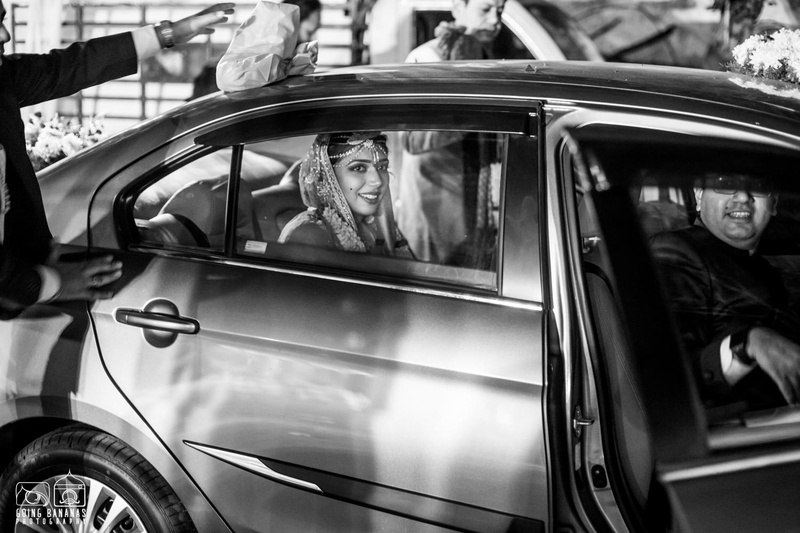 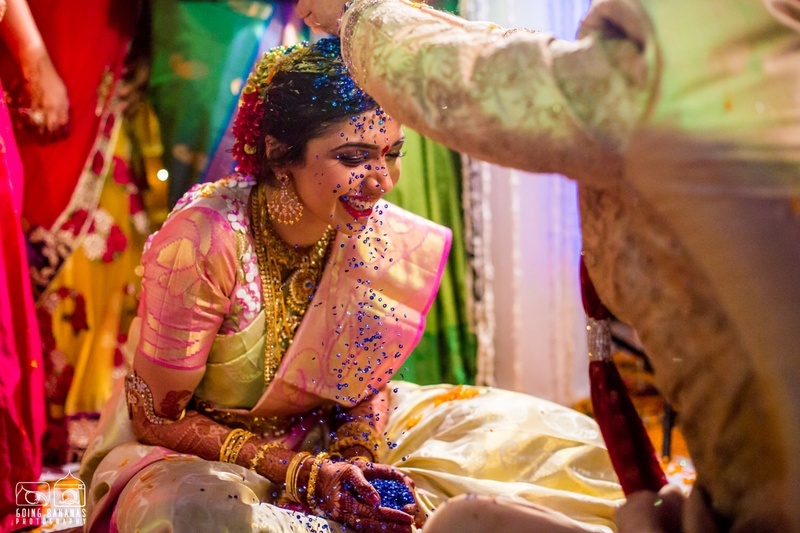 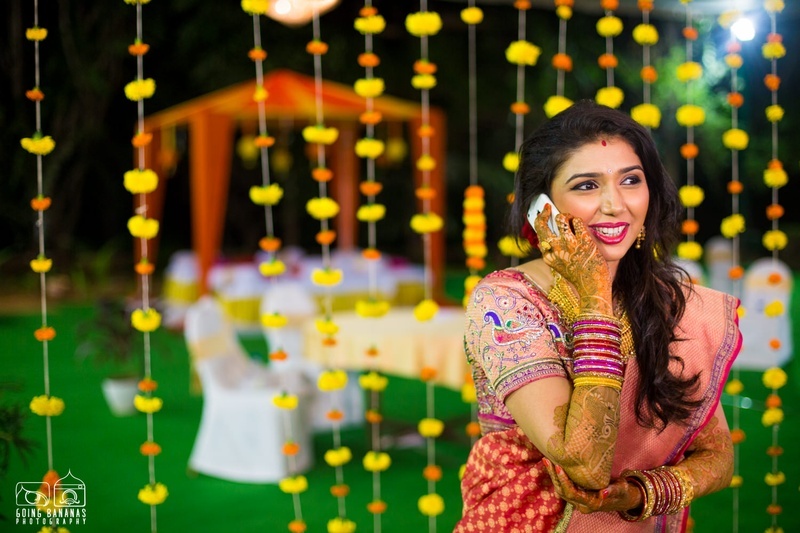 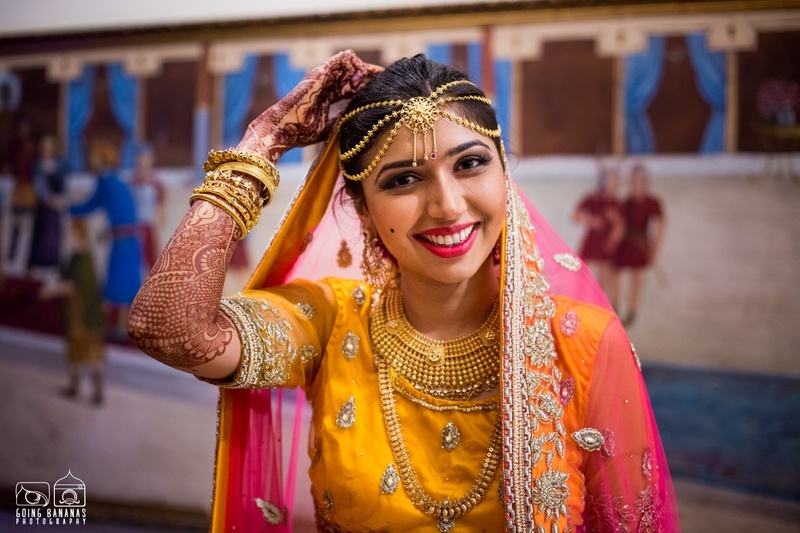 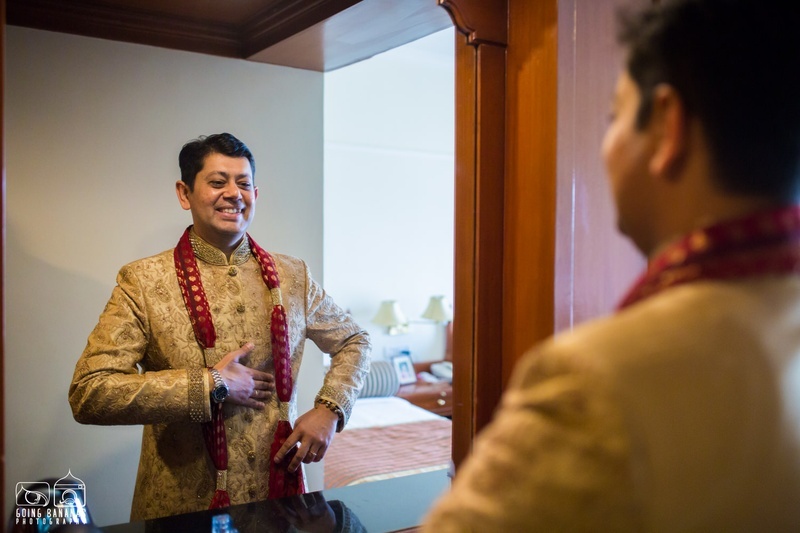 Apoorva and Anshuman’s wedding at Taj Deccan, Hyderabad was a classic South-Indian affair with gorgeous bridal wear, tons of laughter and of course, heaps of love. 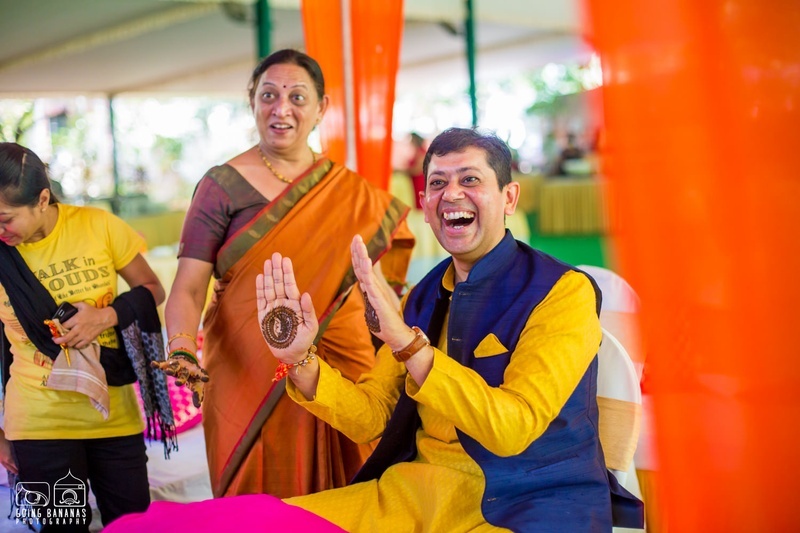 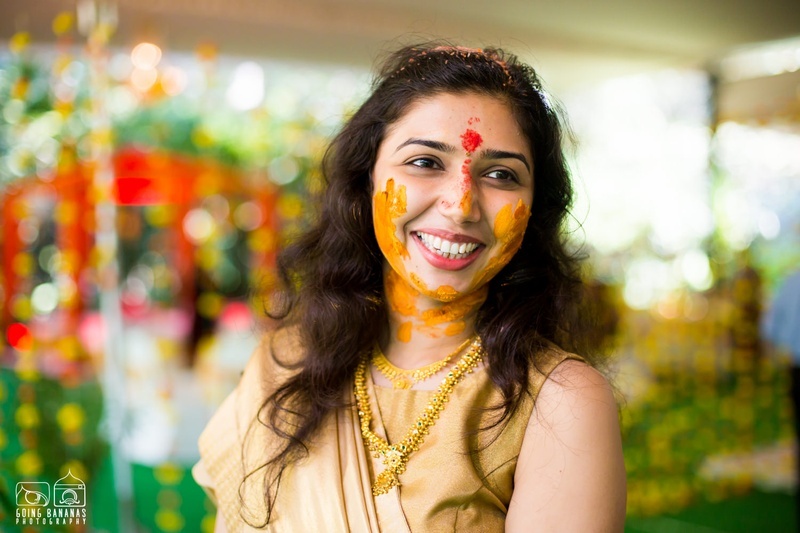 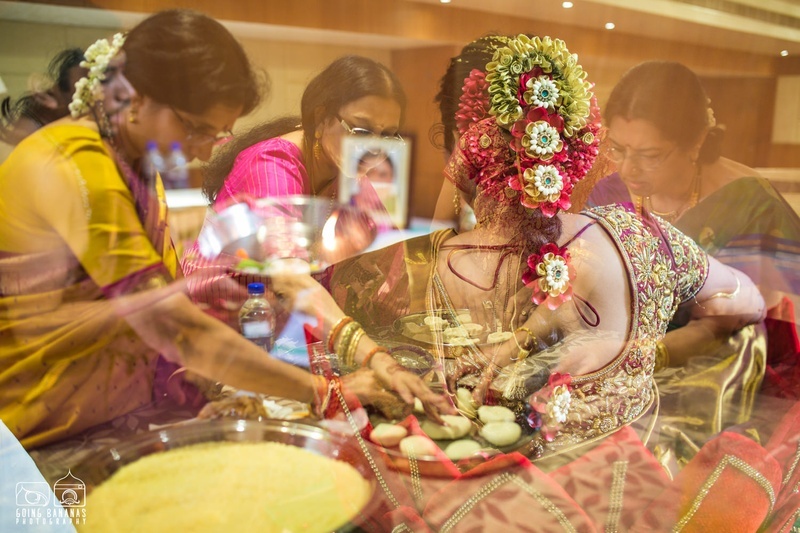 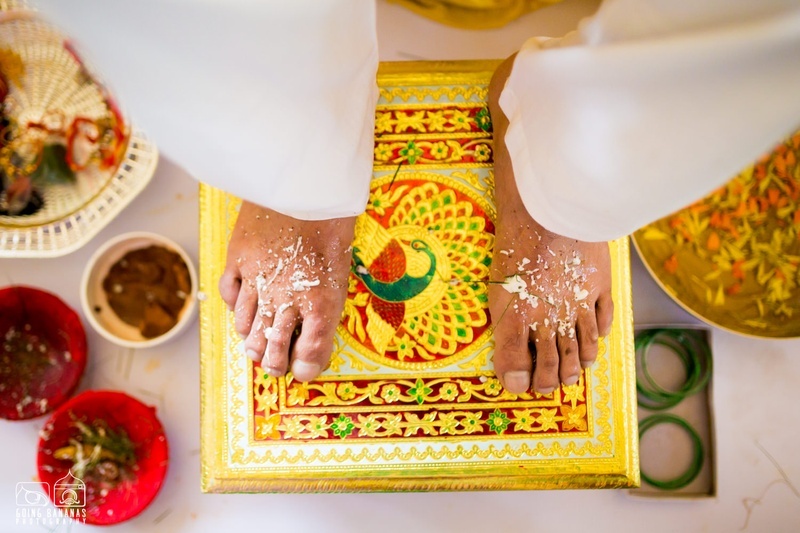 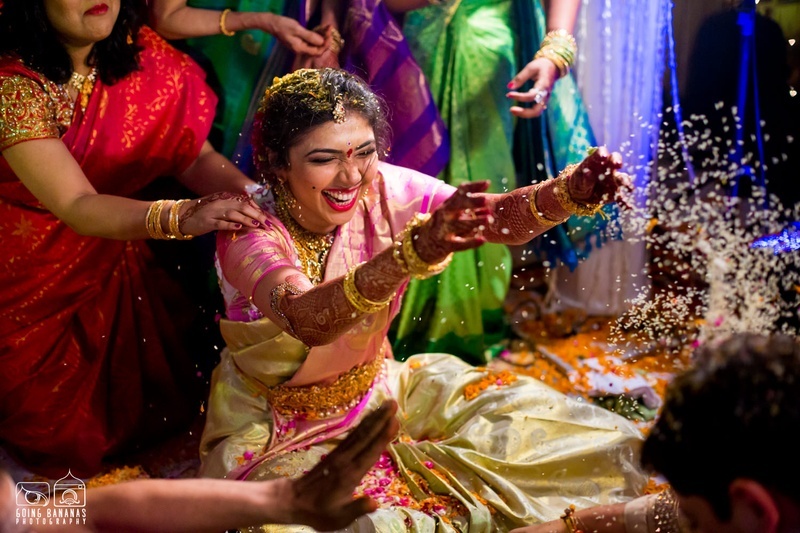 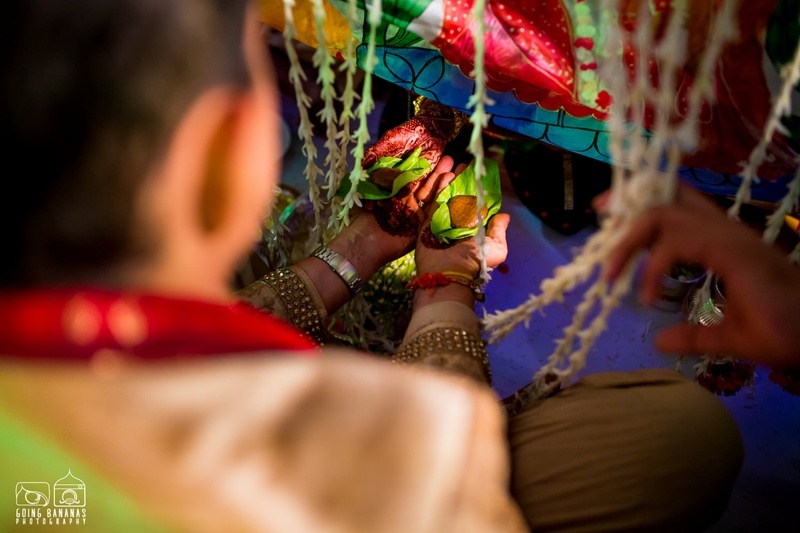 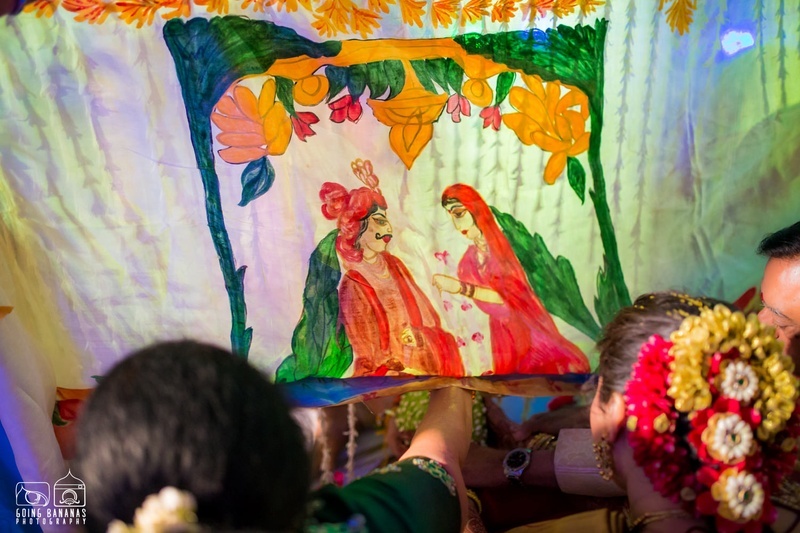 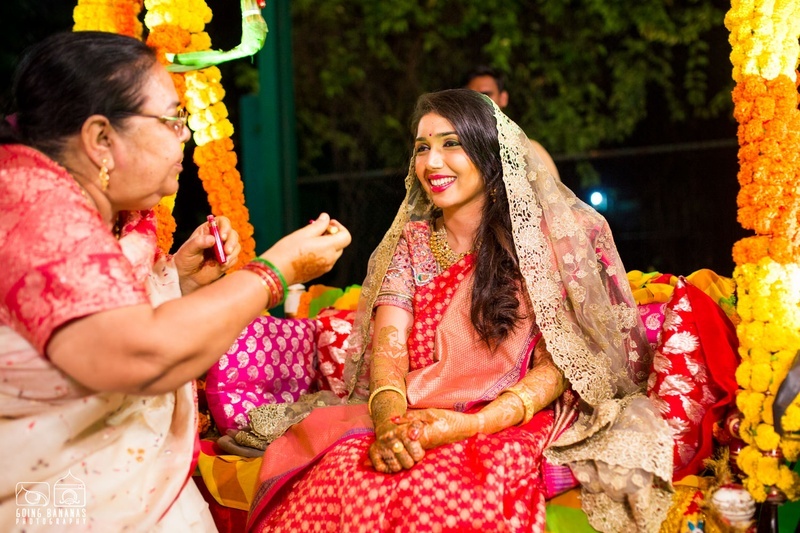 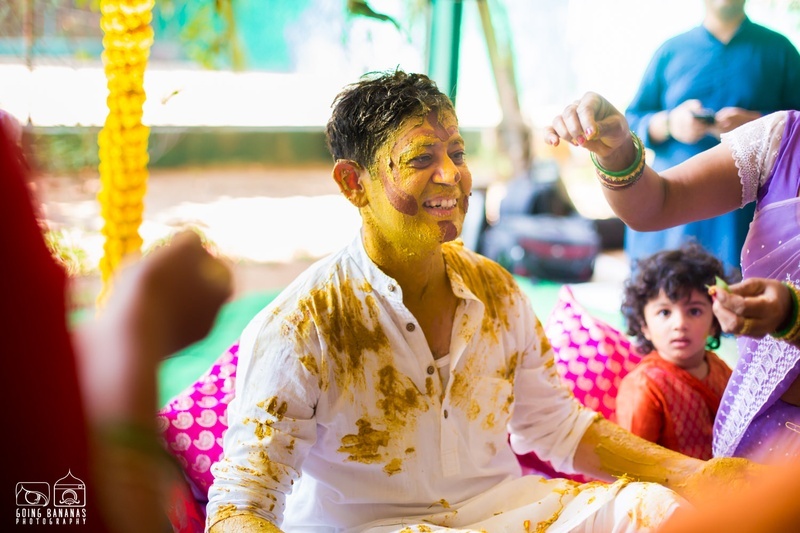 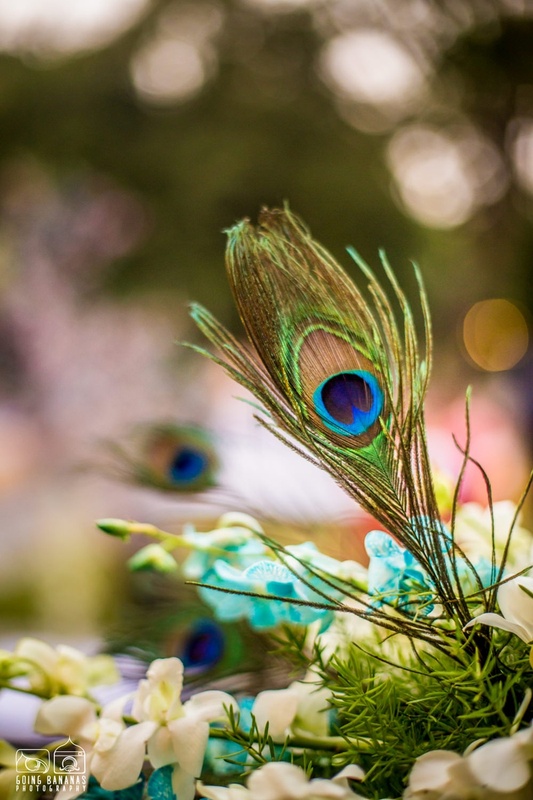 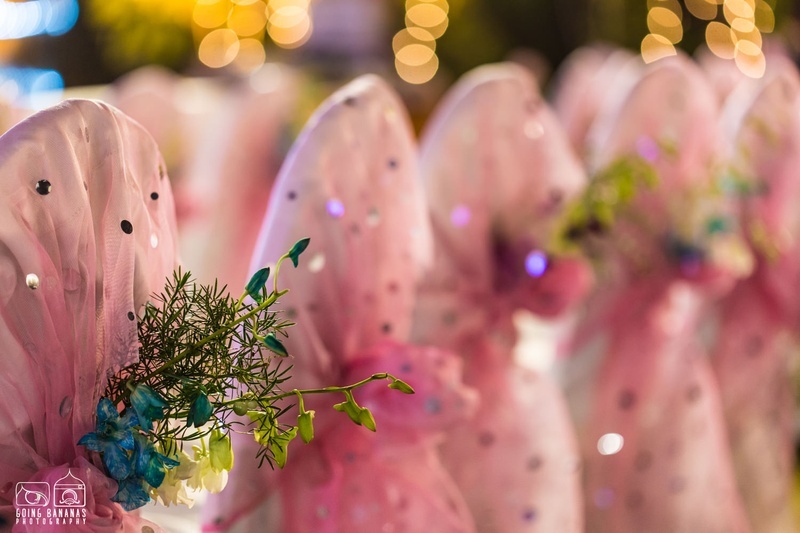 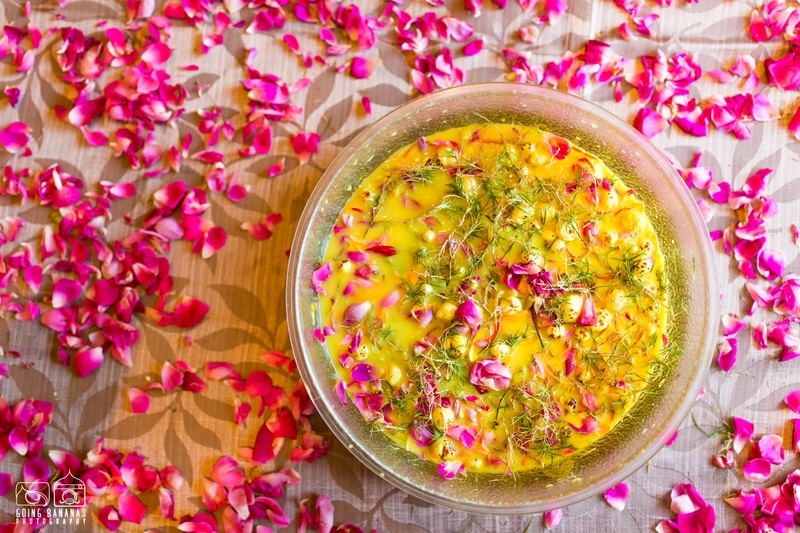 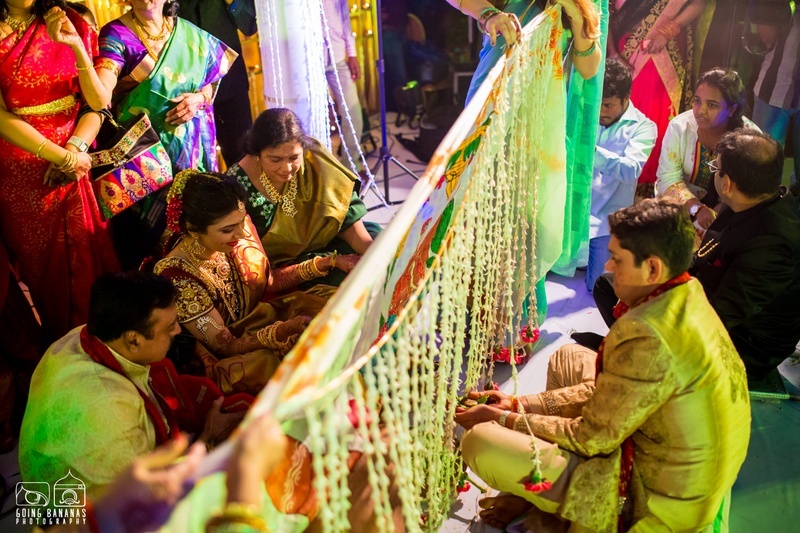 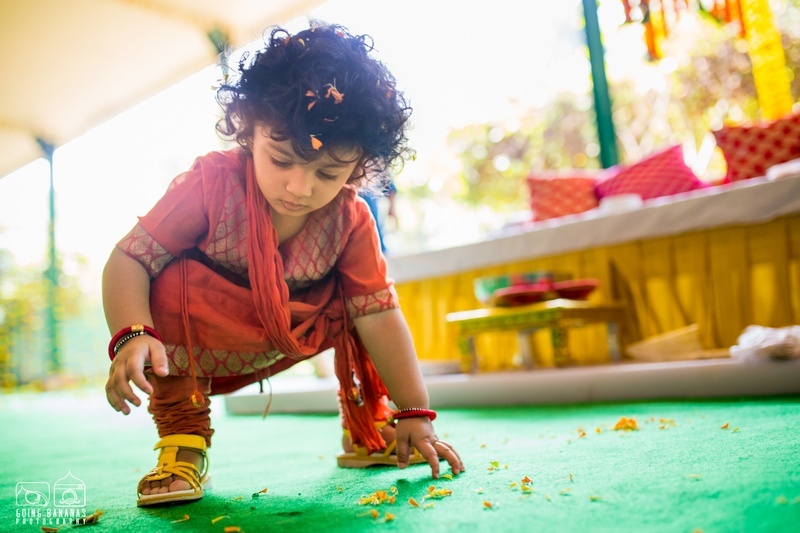 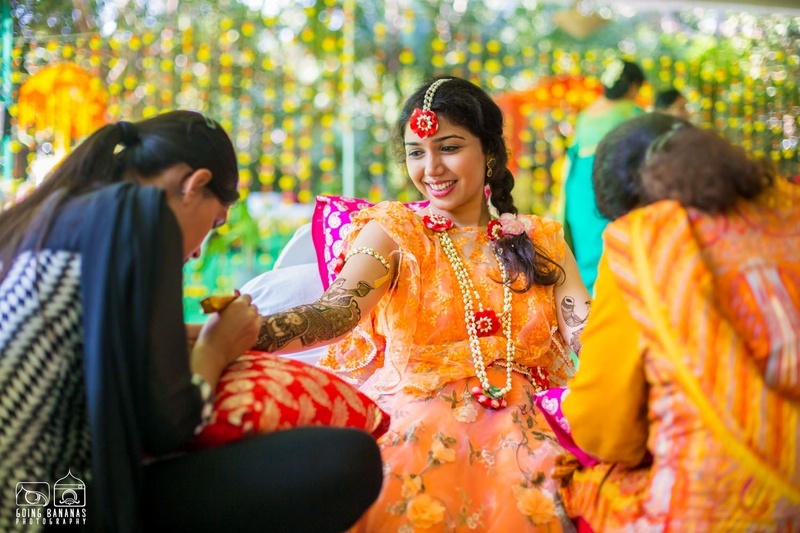 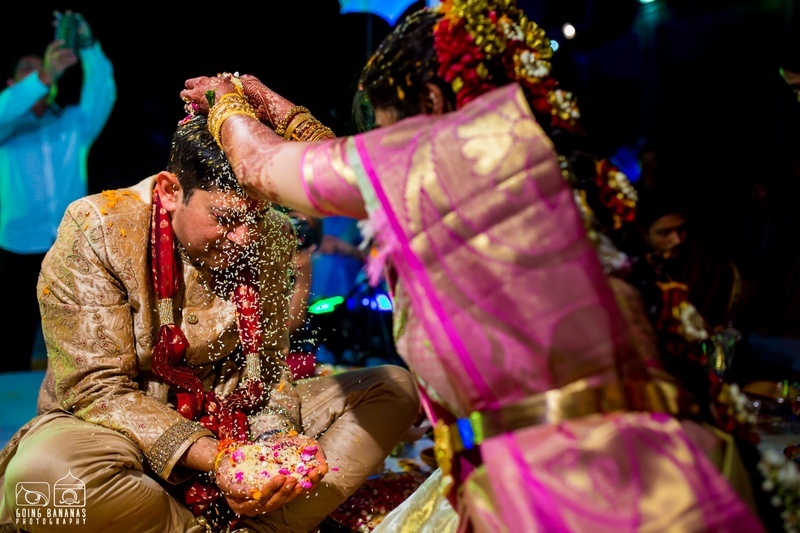 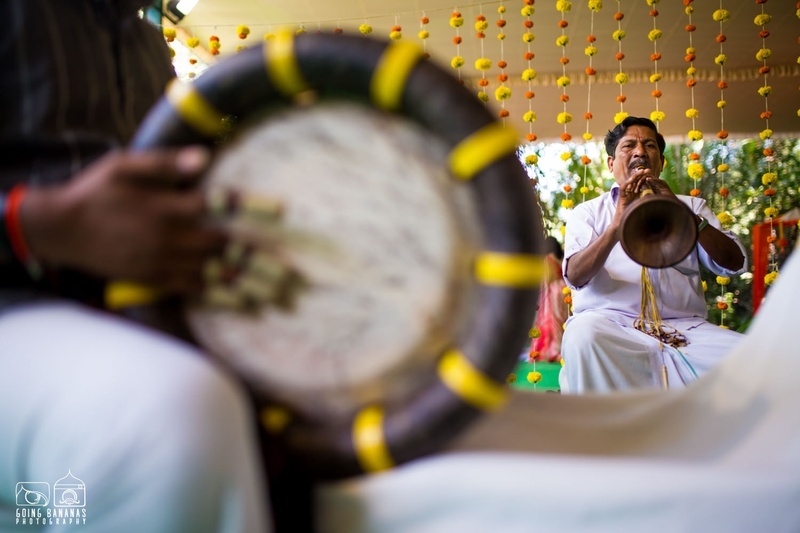 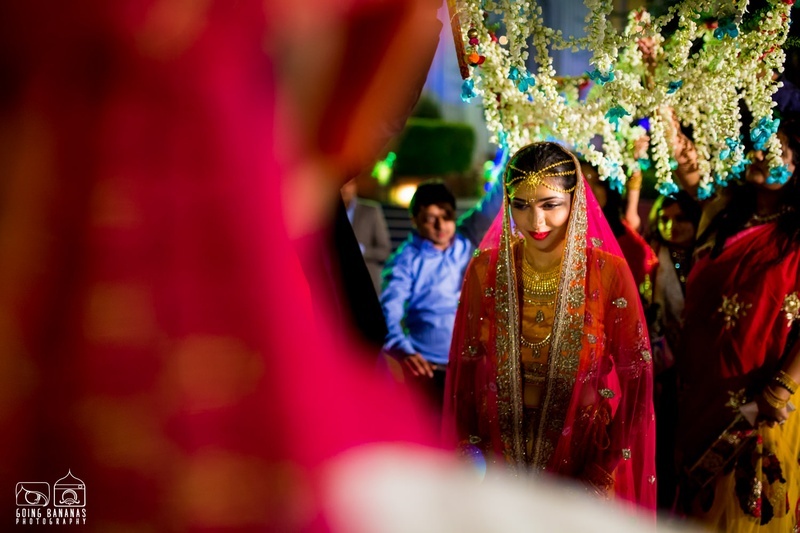 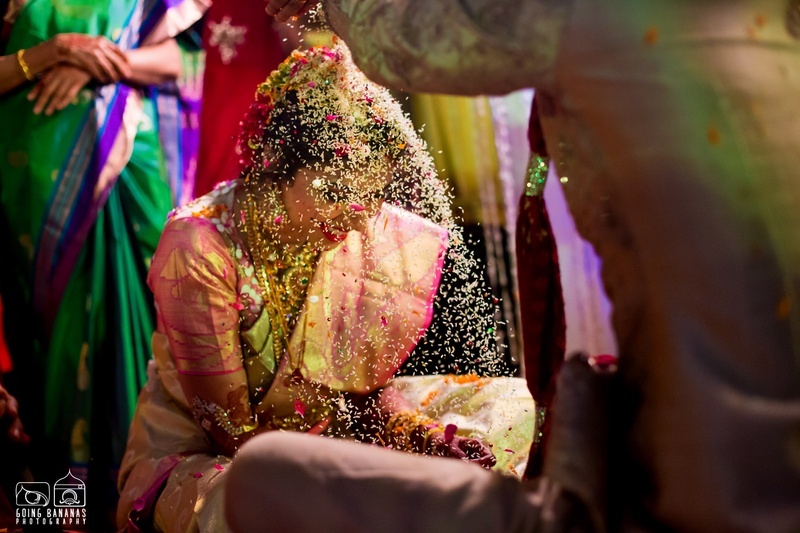 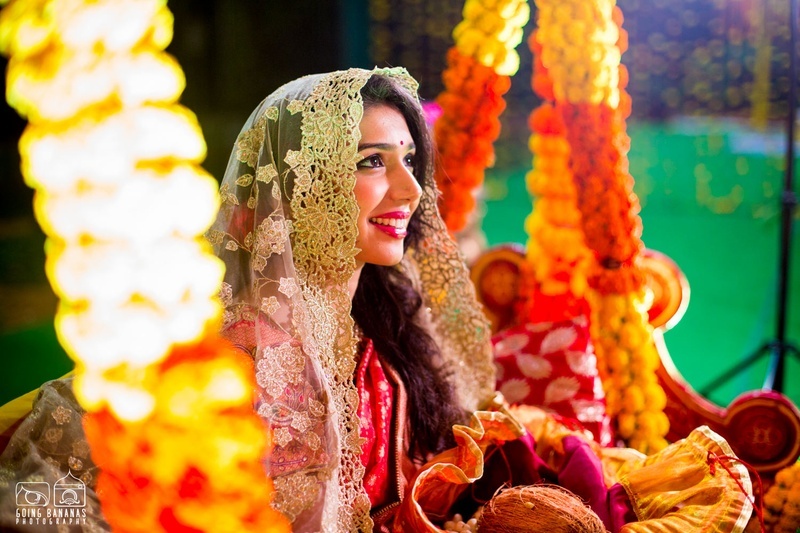 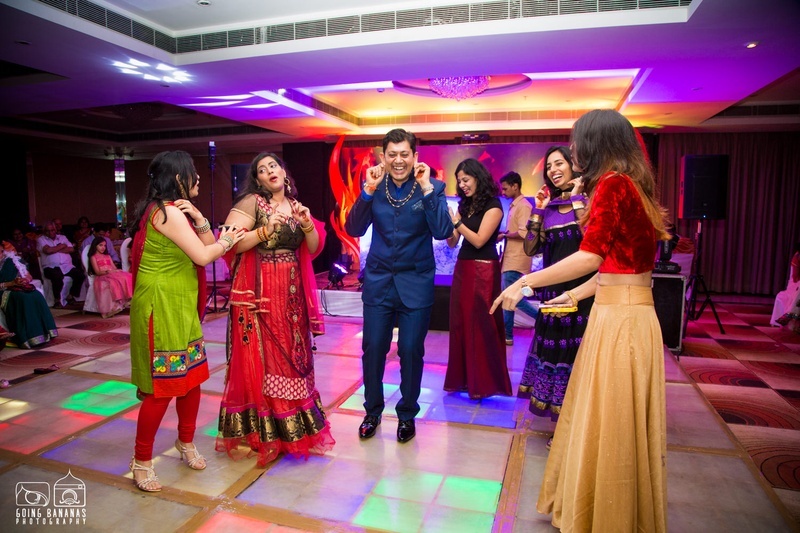 The Mehndi ceremony was a fun-filled event with marigold décor and South-Indian musicians to serenade the on-goings. 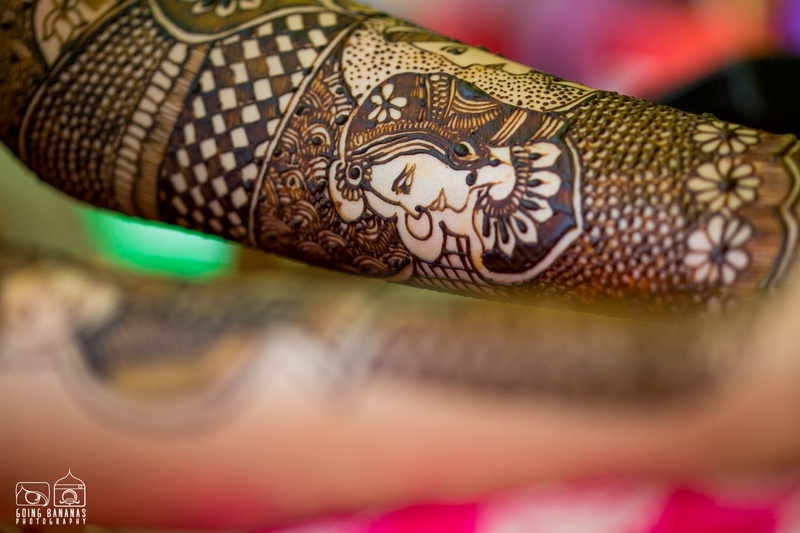 We love the intricacy and detail with which the team at Noorjahan Mehndi decorated Apoorva’s hands! 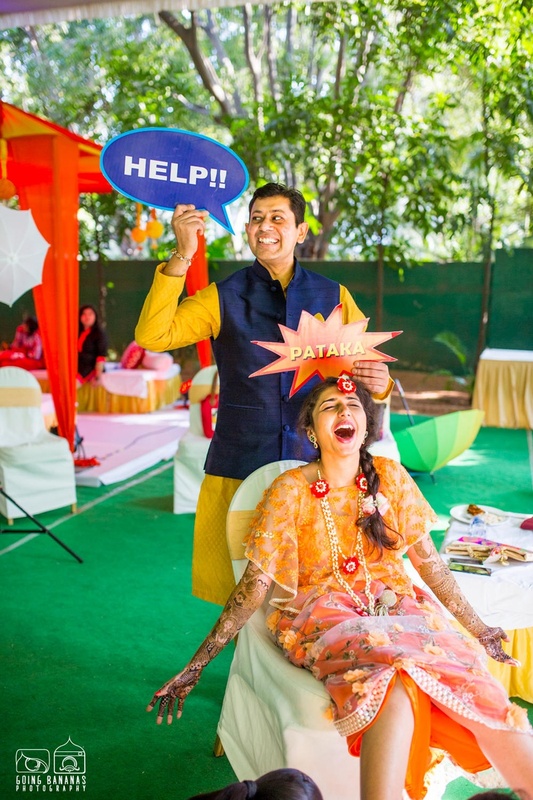 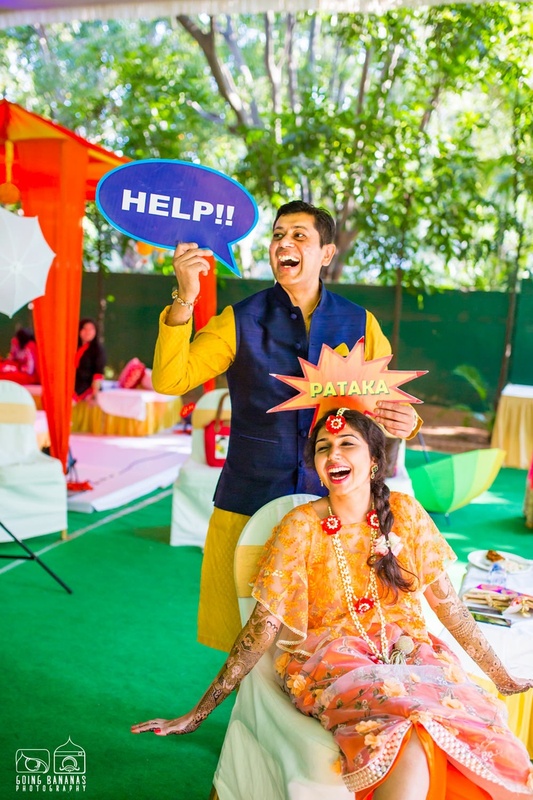 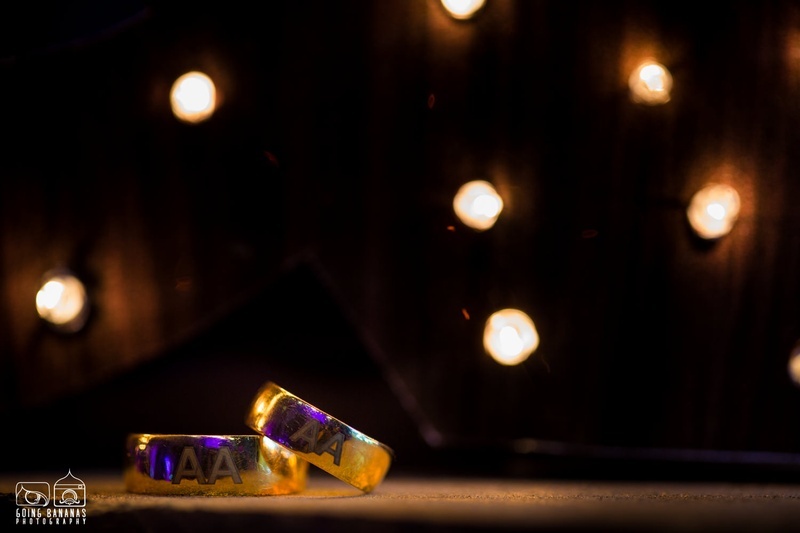 Thanks to Going Bananas photography, this fun-loving couple were candidly captured playing around with the quirky, cute props that they had lying around. 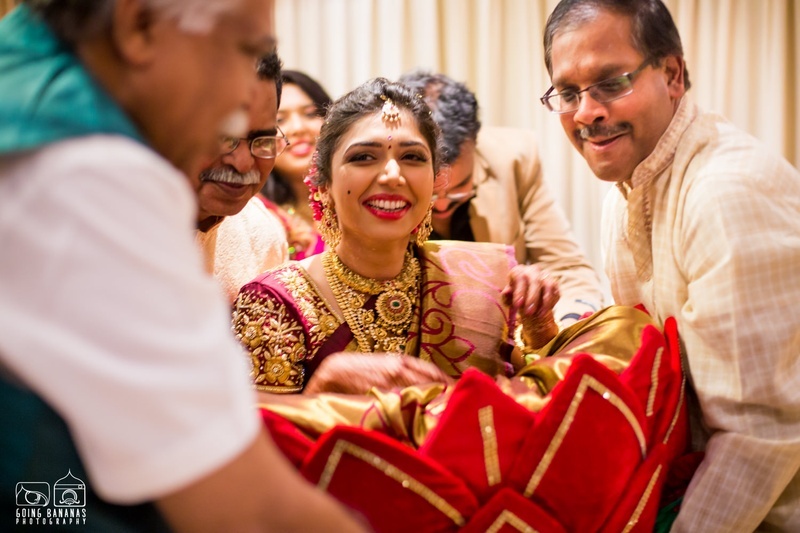 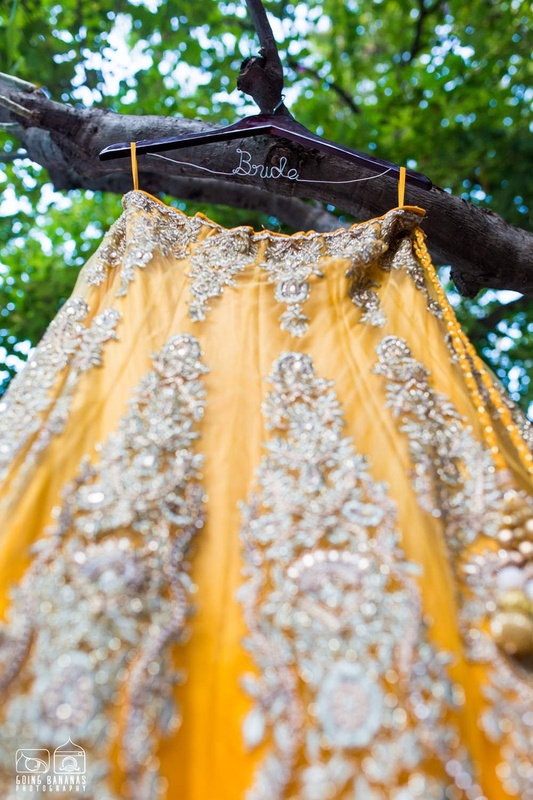 The wedding day rolled around and it saw Apoorva in a gold silk saree with maroon floral designs and zari embroidery. 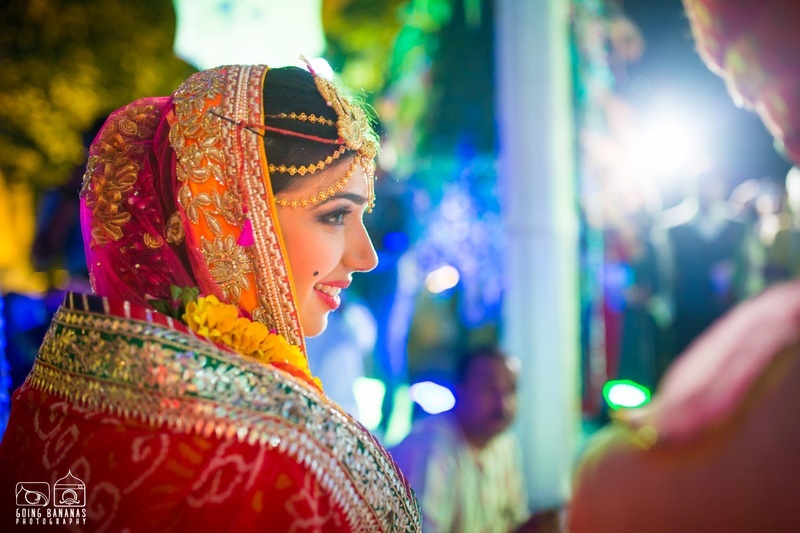 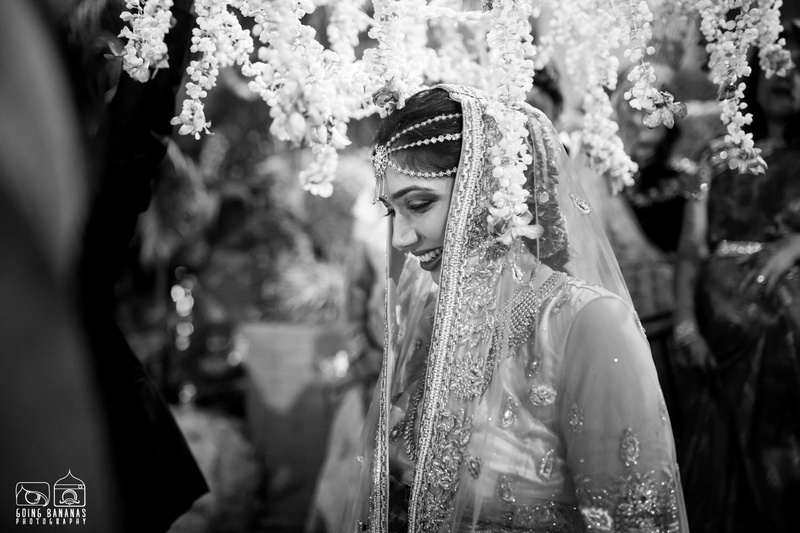 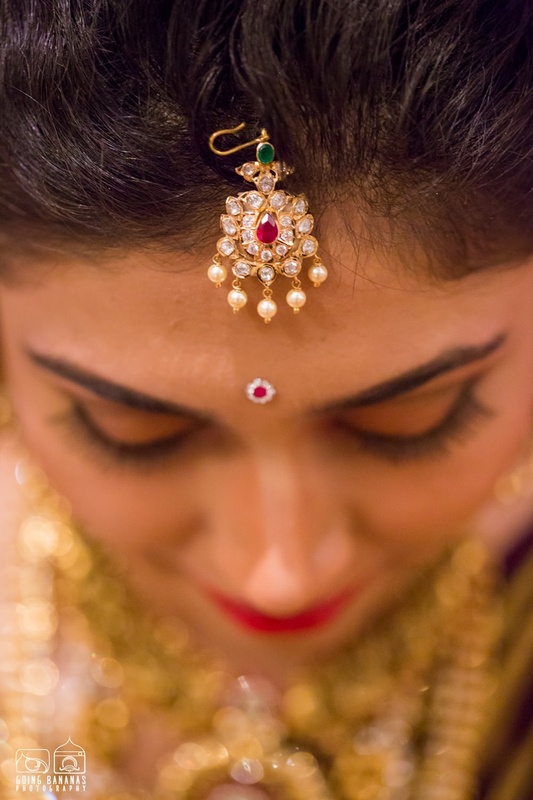 To complete her authentic South-Indian look, she adorned herself with layers of traditional gold and a coined haar. 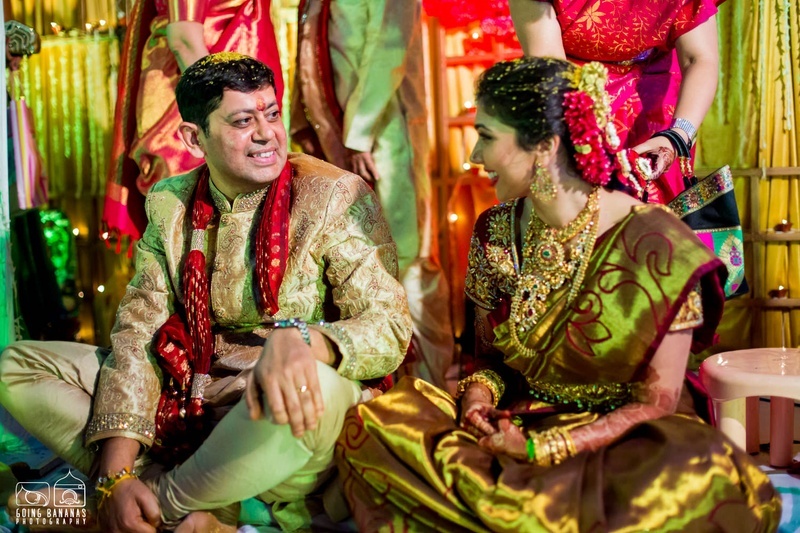 Anshuman colour co-ordinated with his better half by sporting a muted gold sherwani and a matching maroon dupatta with gold details. 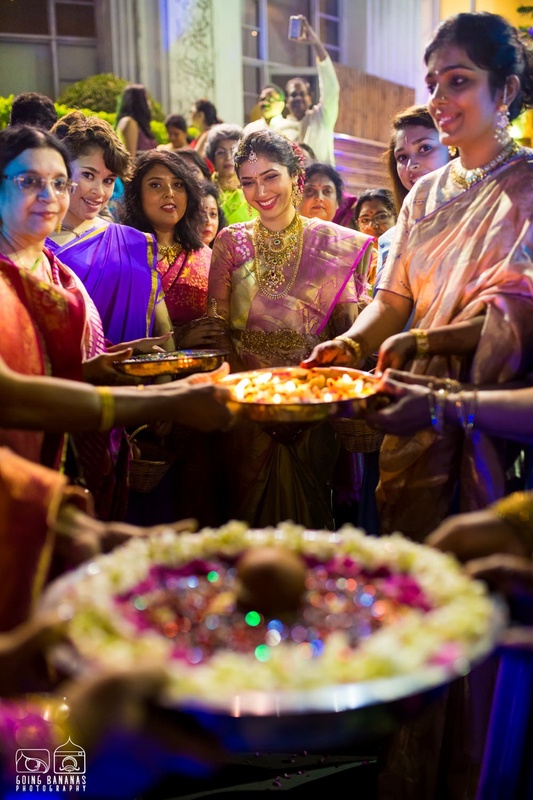 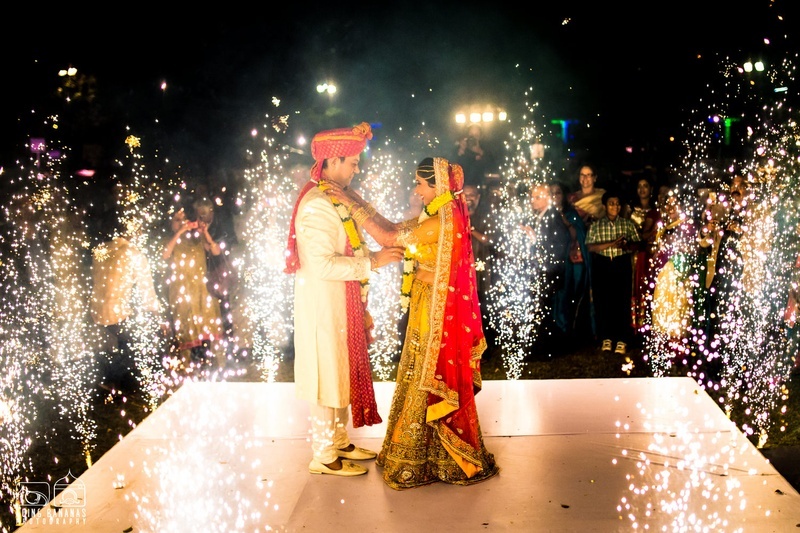 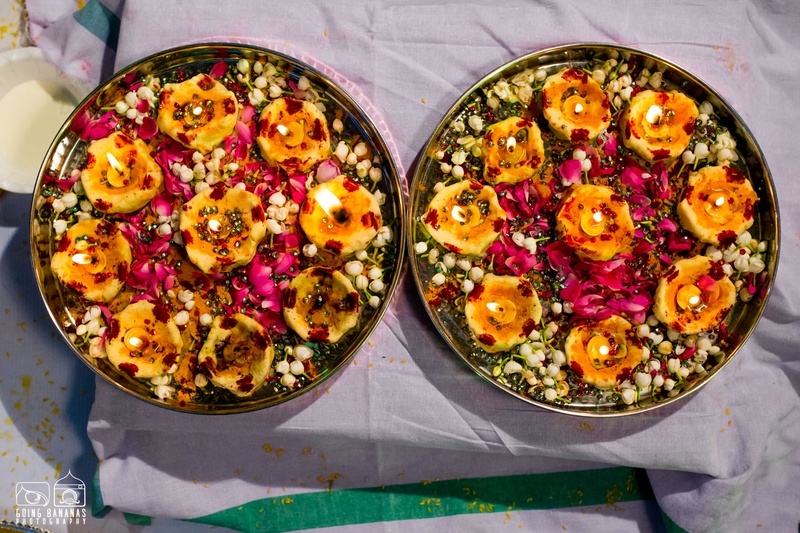 After the formalities of the pooja were done, the Varmala took place joyously with the guests lighting up the event with sparklers. 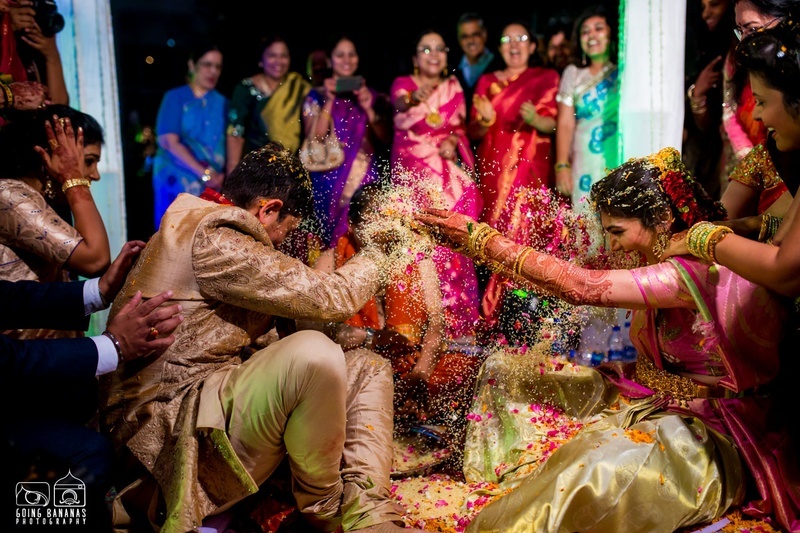 Not once did the smiles on our wedded couple’s faces slip! 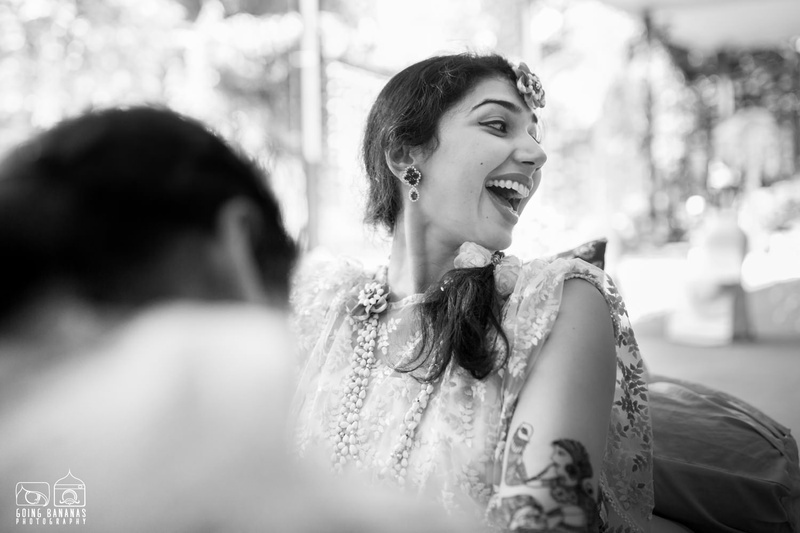 The reception had the same amount of joy and laughter, if not even more. 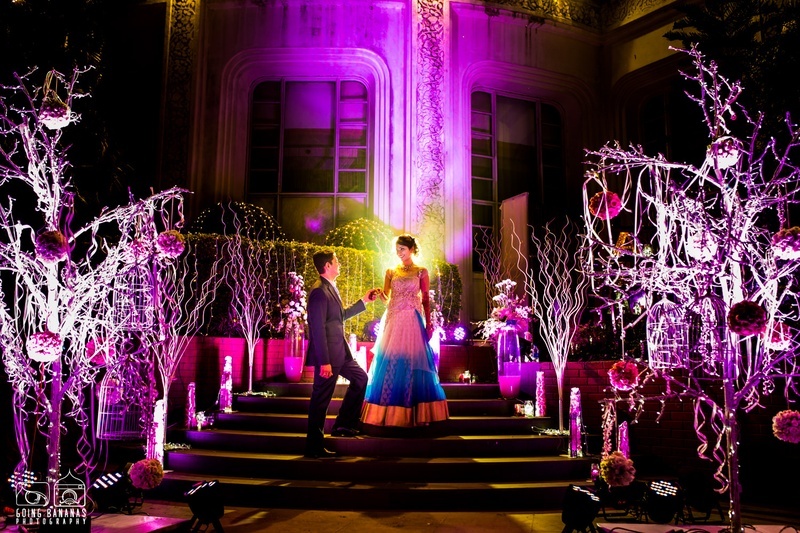 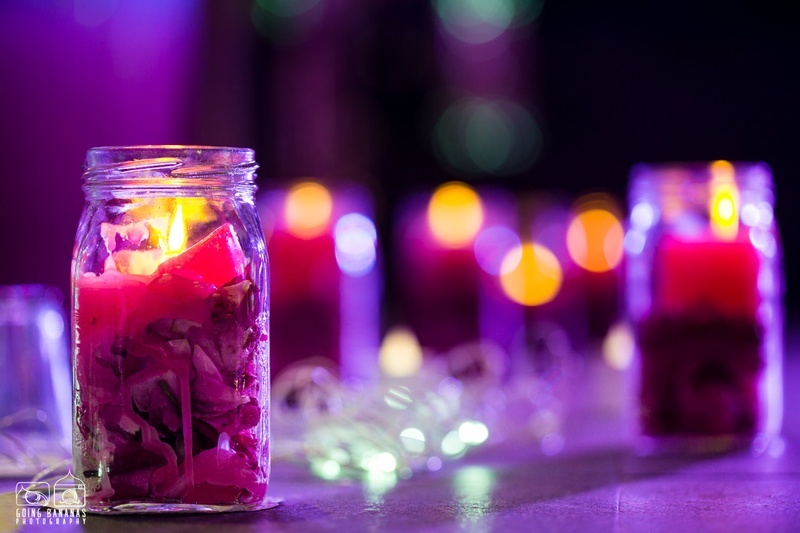 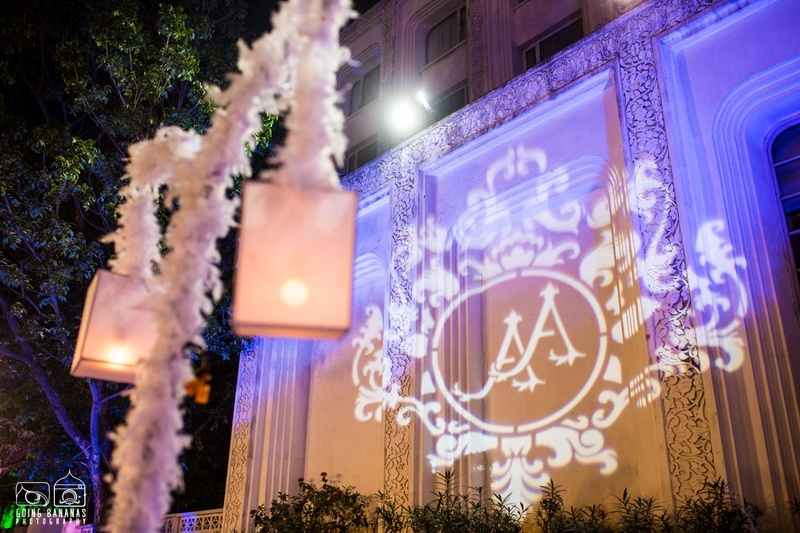 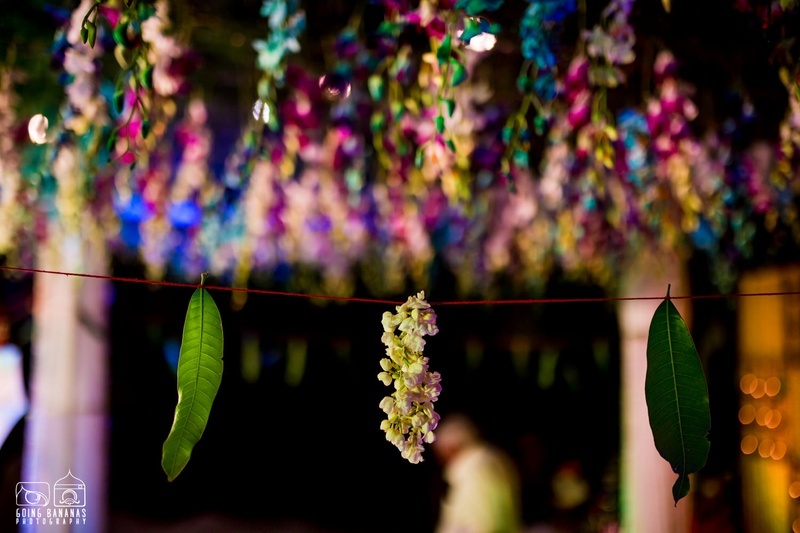 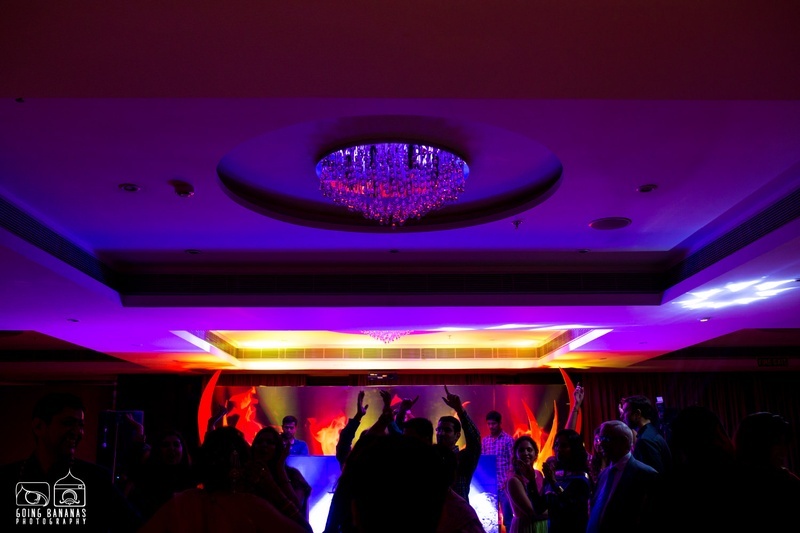 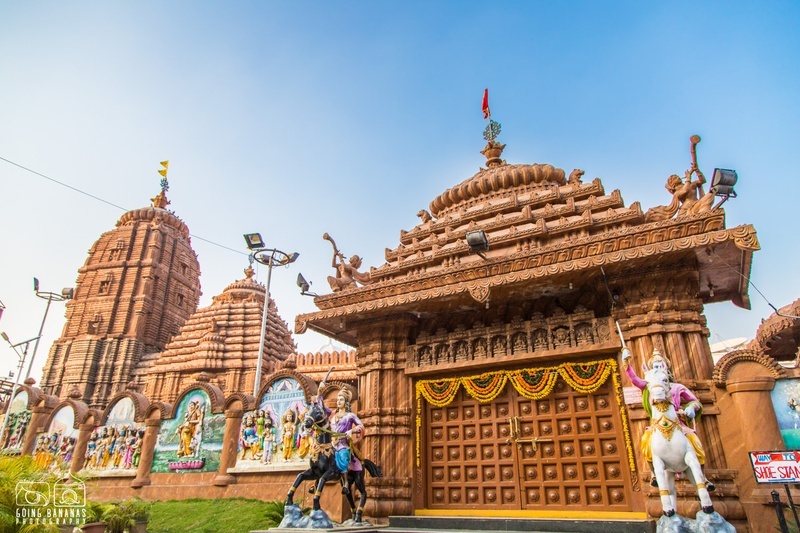 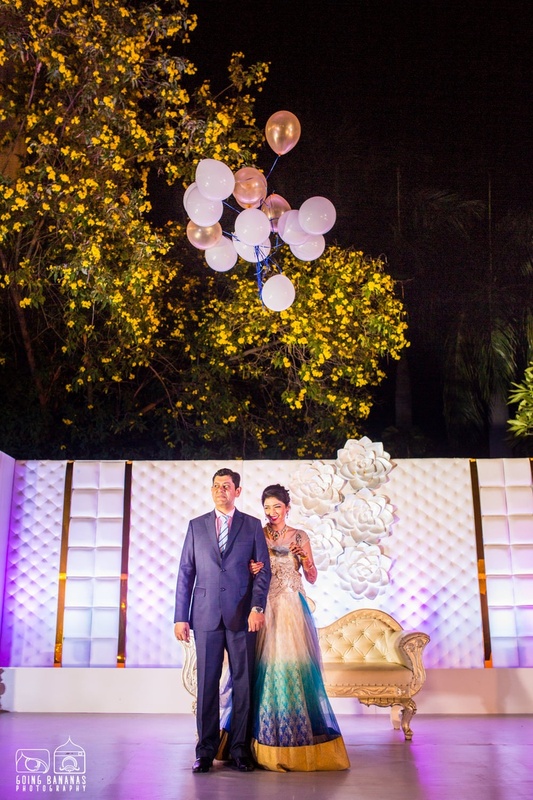 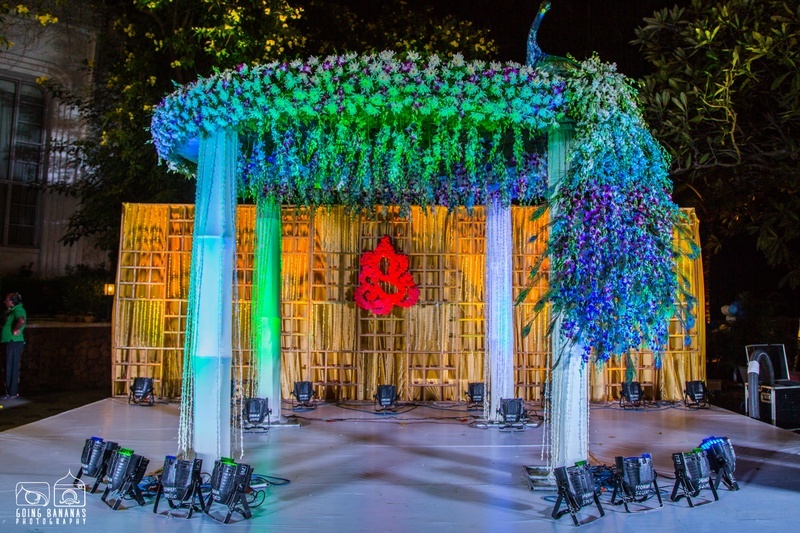 Look out for all the interesting décor that made the venue even more stunning! 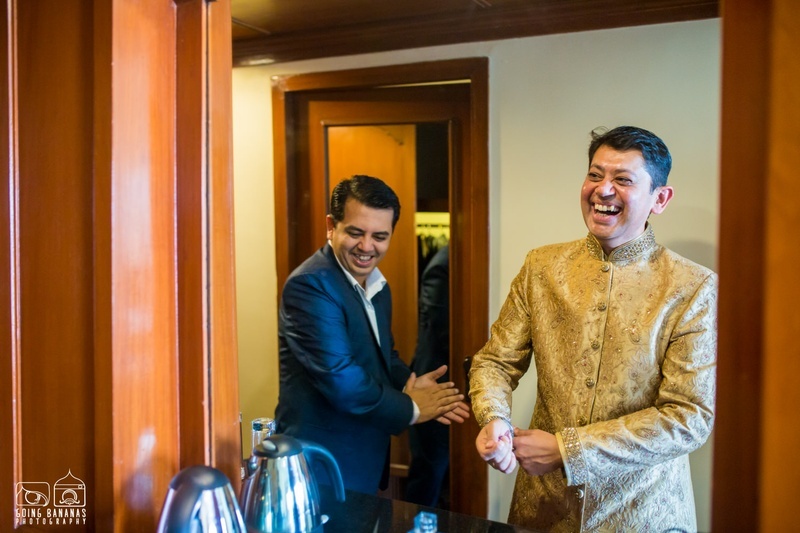 So happy to see family and friends come from across the globe to be there for our special day. 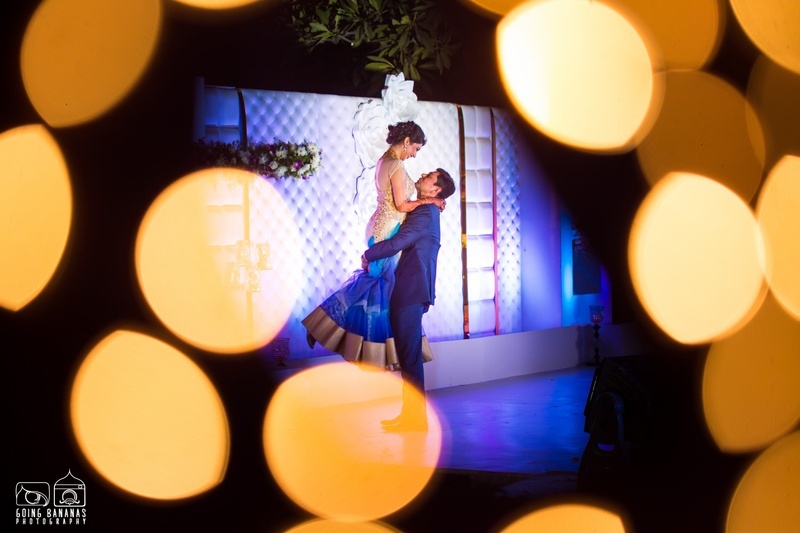 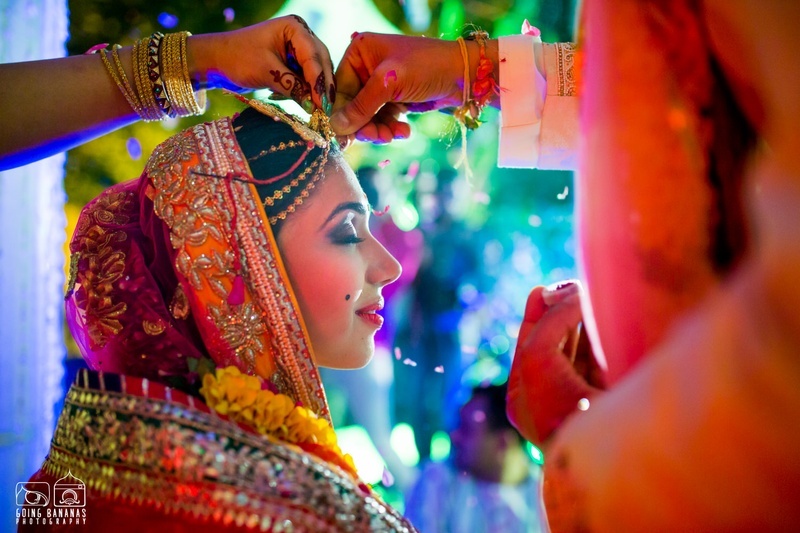 In the sangeet while I was performing, my husband’s expression in his eyes, the love I saw was priceless. 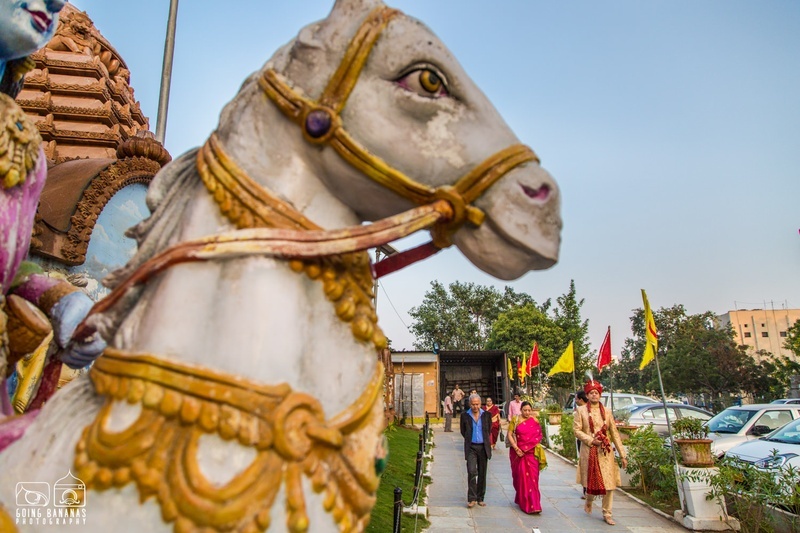 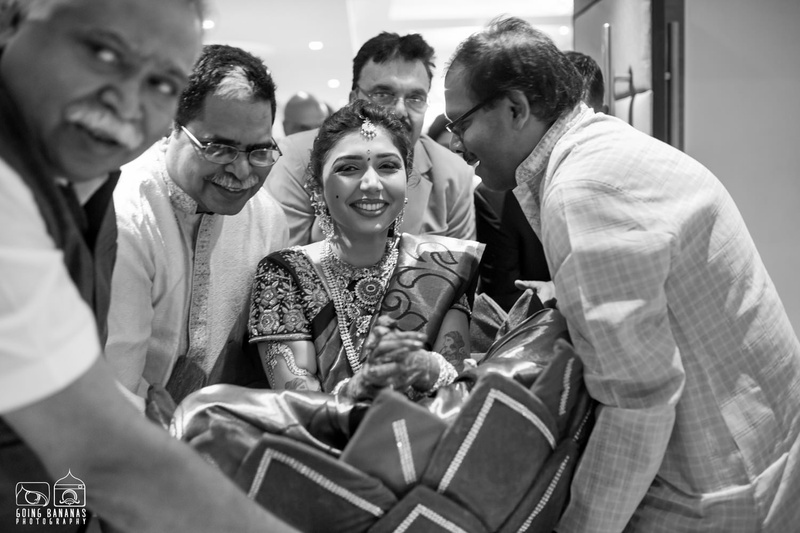 My uncles carrying me to the mandap in the basket was really memorable. 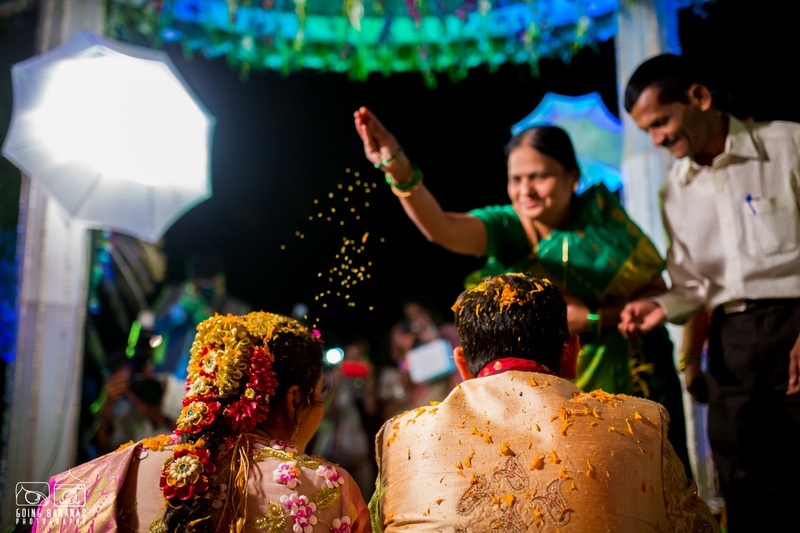 The rice shower ceremony in the wedding was a lot of fun. 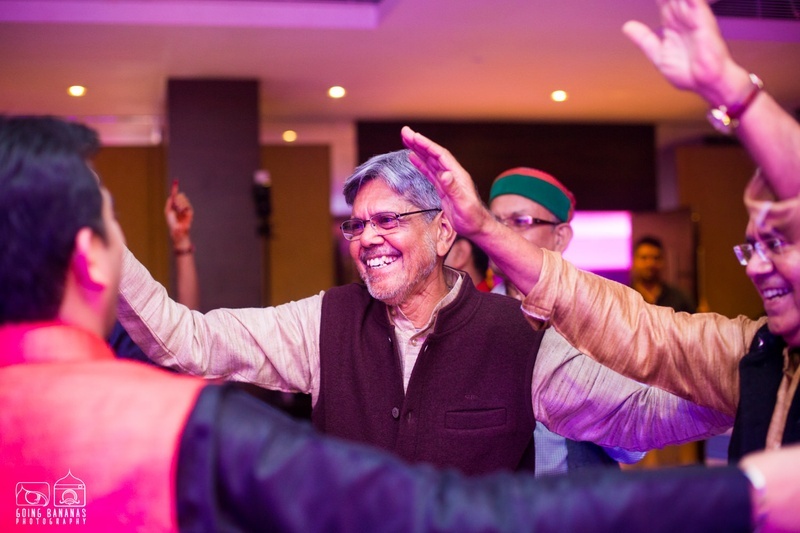 The happiness on my parents face throughout the wedding was priceless. 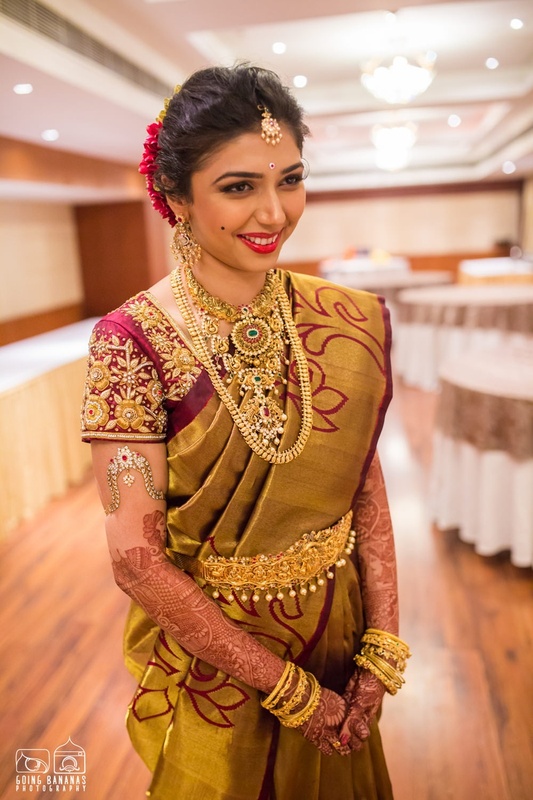 Apoorva dressed in a gold silk saree with maroon floral designs and zari embroidery.